Sometimes when I’m coaching a client they will say that they feel lost or that they feel they may have missed their calling or they should have done this or shouldn’t have done that. I let them go on for a minute or two as they explain their regret or frustration, how they missed their chance, and how their life has passed them by. 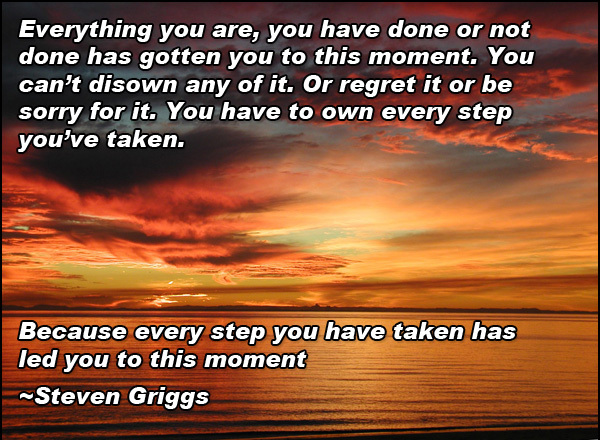 Everything you are, you have done or not done has gotten you to this moment. You can’t disown any of it. Or regret it or be sorry for it. You have to own every step you’ve taken. Because every step you have taken has led you to this moment. Whether you are 20, 40 or 80, age doesn’t matter. What matters is that you acknowledge that you are right here, right now. In the place you currently find yourself. In the circumstances you currently find yourself. Past and future don’t matter. What matters is what’s next? Feeling that you are too old or past your prime or all used up is simply self-pity. You aren’t any of those things. Feeling that you are too young and don’t know what you’re doing is also self-pity. Age is irrelevant. Start by starting. Unsure about what you should be doing? Stop asking questions and take a look at how you feel. What feels right? What can you picture yourself doing? You have every answer, right now. It’s all in there. You just have to stop asking questions and start listening. You are forgetting who you are. If you don’t like your current circumstances, change them. If you feel you missed your calling, what is it? If you get started today but a few days later feel lost again, stop, get centered, remember who you are and start again. There is no yesterday, there is no tomorrow, there is just right now. Everything starts from right now, right where you are at this moment.